Why Isn't Everyone Healed? Why do some people get healed and others do not? Is there more than one way to receive divine healing? What is the "best" way? Out of the riches of a ministry that has spanned half a century, Rev. 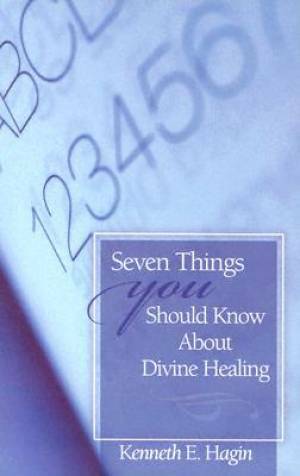 Kenneth E. Hagin answers these and other questions in his book Seven Things You Should Know About Divine Healing. Rev. Hagin began his study of divine healing as a teenager after five eminent physicians gave him up to die. In this book, he shares the results of his lifelong study of the Scriptures as well as actual case histories. Seven Things You Should Know About Divine Healing is a book you will want for your personal library and to share with friends and loved ones who need healing. Discover for yourself. * The source of sickness and how to stand against it! * Ways to obtain divine healing! * How to keep your healing! 7 Things You Should Know About Divine Healing by Hagin Kenneth E was published by Faith Library Publications in January 1982 and is our 6982nd best seller. The ISBN for 7 Things You Should Know About Divine Healing is 9780892764006. Be the first to review 7 Things You Should Know About Divine Healing! Got a question? No problem! Just click here to ask us about 7 Things You Should Know About Divine Healing.